The eXact Precision night vision scope can be used for a multitude of applications including paintball, security surveillance and star gazing. The unit may be used as a handheld monocular as well as easily transformed into the most affordable night vision aiming device by assembling it with the weaver mount and eye flip, which are included in the kit, and placing it in-line with a suitable Reflex Sight. The product becomes usable for hunting and use with paintball markers and air soft guns. 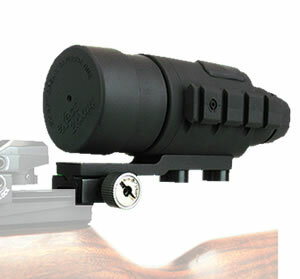 This scopes rugged design makes it suitable for use in harsh field conditions such as hunting, boating and hiking. Magnification - 2.6x, Objective lens diameter - 44mm, Lens system - 59mmF/1.2, FOV at distance 200 yards, ft/m - 162 / 49, Focus range, yards - 1.5 to infinity, Eye relief distance - 12mm, Diopter adjustment - +4 -4, Detection distance (approx.) yard / m - 275 / 250, Overall dimensions, in/ mm - 7.16''x3.94''x2.56''/182x100x65, Weight, oz/g - 14.9 / 422, Power supply - AA 1.5V battery (two), Estimated battery life (w/out IR) - up to 70 hours, Operating temperature °F/°C - -22 to +113 / - 30 to +45, Water intrusion - Meets IPX4 rating, Humidity - up to 93%. Night vision monocular, Lens Cap, Protective carrying case, Weaver mounting rail, Long relief eyepiece, User manual.